The Almeida's hit production of King Charles III is scheduled to transfer into the West End this autumn. The Almeida’s hit production of King Charles III is scheduled to transfer into the West End this autumn. The Wyndham’s Theatre has been lined up to take the show, following Stephen Daldry’s production of Skylight starring Carey Mulligan and Bill Nighy which runs from 7 June to 23 August 2014. 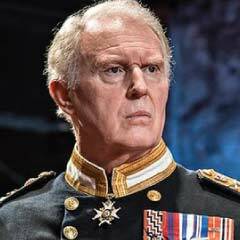 King Charles III by Mike Bartlett has enjoyed rave reviews and a sold-out run at the Almeida Theatre. Directed by Rupert Goold the show stars Tim Pigott-Smith as King Charles, plus Katie Brayben, Oliver Chris, Richard Goulding, Nyasha Hatendi, Adam James, Margot Leicester, Tom Robertson, Nicholas Rowe, Nick Sampson, Tafline Steen and Lydia Wilson. The play is written in (very accessible) Shakespeare-style verse, and covers the death of The Queen and Prince Charles’ ascension (or maybe not) to the throne. Alongside some stand-out performances including Pigott-Smith, the play is beautifully written and staged, and the Royal theme would pull in tourists alongside regular West End theatregoers.